Triage is in effect among those opposed to the incoming administration and the president-elect's cabinet picks. This morning’s Senate hearing for Ben Carson was not a exercise in determining whether he should be confirmed. Instead, a group of people certain he was going to be confirmed tried to get Carson on record supporting their positions. The appointment of Carson, a neurosurgeon with no housing experience, has been described as one of Trump’s most baffling moves. But it’s baffling not only in that he does not have any relevant experience, but in that people can’t suss out an ulterior motive, unlike so many of the other nominations that have clear conflicts of interest and a strong likelihood to undermine the very missions of the agencies they are nominated to lead. It’s clear that citizens and the Senate alike have decided that Carson is not worth fighting over. That said, there were some useful and pointed exchanges in the hearing. Sen. Elizabeth Warren, not surprisingly, had some very sharp questions for Carson, pushing him on whether he would commit that no HUD dollars would end up in the pocket of the incoming president or his family. He declined to make that commitment, saying vague things about how he wanted the agency to work for all Americans, not just one, but that he wouldn’t cancel a program just because $10 of it might make it into Trump’s pocket. After pushing a few more times, Warren noted that he couldn’t make that commitment because he didn’t have that information, because Trump is hiding his business interests from everyone. Other senators followed up on this point, with Sen. Sherrod Brown getting Carson to commit to creating a process to report to the committee any issues that come before HUD having to do with HUD-subsidized properties in which the Trump Organization is invested (of which apparently there is at least one known so far). 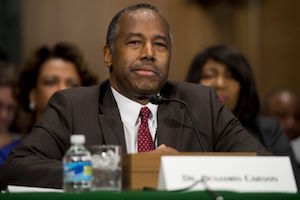 Aside from that point, Carson spent the hearing promising to do nearly everything everyone on both sides of the aisle wanted–advocate for the HUD budget and cut across-the-board non-defense spending, cut programs that aren’t working but support every program specifically asked about, not impose “top-down solutions” and support regulations to get lead paint out of housing, and reduce red tape and fraud. A frequent topic was his previously expressed opinions on government assistance creating dependency (which is a myth). He didn’t exactly disavow this position, but tried hard to spin it to mean that people should receive other help to become economically independent along with their housing (education, training the trades … ). However, when pressed on specifics, he sang a fairly different tune. Under probing from primarily Democrats who talked about how housing is the best foundation for a “hand up” approach, housing first successes, and the book Evicted, Carson said repeatedly that “safety net programs” like rental assistance were “essential” and that you should never pull the rug out from under people before you have an alternative in place. Now, he never detailed what his alternative would be, making that a potential danger zone, but also one on which there is time to fight. Carson walked back his 2015 criticism of the affirmatively furthering fair housing regulations, saying that he would enforce them and was a supporter as long as it didn’t involve people in D.C. telling local jurisdictions how to solve their fair housing problems and where exactly to build. (Of course if a local jurisdiction refuses to solve those problems themselves, outside intervention will be needed to make a change, which he did not address.) He called the Fair Housing Act one of our most important pieces of legislation. Carson's ideological conservative credentials were on display when he refused to support minimum wage or overtime provisions, and spoke instead of vague “good business environments” that would force employers to pay better due to competition (good luck with that), and when he said he believed we could have a 30-year mortgage entirely through the private sector without a government guarantee despite nowhere else in the world pulling that off. One of the most interesting differences from many other right-wing politicians was that Carson, despite his fear of supposed assistance-caused dependency, carefully steered clear of speaking of poor people in negative terms. No welfare queens. No criminal element. Instead he spoke a lot about how to compete with India and China, we were going to have to “develop the human capital” of every single American. This is actually eerily reminiscent of the equity arguments about how leaving large segments of people behind drags us all down. Again, the devil will be in the details. When he does a “listening tour” how much will confirmation bias affect what he hears? Will he try to “develop” human capital by forcing work requirements onto rental assistance recipients? (Much as he likes to say he’s not paternalistic, if he doesn’t want to force good behavior on businesses, instead creating an “environment in which they will create more opportunity” then hopefully he would at least extend the same philosophy to individual citizens. But I won’t hold my breath.) Will “not pulling the rug out” mean a short off ramp before some totally inadequate and punitive bootstrap program replaces crucial programs? We’ll see. But he’s on record today as being far more supportive of the goals of HUD and affordable housing advocates than any of his previous statements would have suggested.